Did you know that I don't wear a bullet-proof vest when I ride out with the cops? Have I mentioned that? Well, it's true. So what, right? It's not like I do anything dangerous out there, even though I've been riding shotgun in Charlie Sector for over a year now (I say "shotgun" because they don't let me drive and I know where the button is that releases the shotgun between the driver and passenger seats. No, I won't tell you which button it is). Last week, , though, we had a warrant service on someone who had a felonious, but non-violent, criminal history. And (obviously) an active warrant for her arrest. We were pretty sure we knew where she lived and that she was home, but the concern was that she would look out the window when an officer knocked and simply not answer. No door kicking-in, on this one. So I piped up: "Hey guys, I'm in civvies, why not let me knock on the door? Use some of that English charm. Huh? Huh??" See, I like action not paperwork. When my parents lived in Africa I visited and walked out onto mudflat to get photos of crocs and when a local got scared at the sight of a mammoth rock python, I poked a bush with a stick, looking for it. After all, I'd only seen the last eight feet of it disappearing into the shrub, I wanted to see the business end. So knocking on a door? Pffft. Easy. And my officer (Charlie 501, who I've ridden with several times and who I now consider a friend) said, "Hey, cool, lemme ask Sarge." At which point, I thought (but didn't say): "Lemme ask wife." The two most important women in my life at that moment, they had me covered. 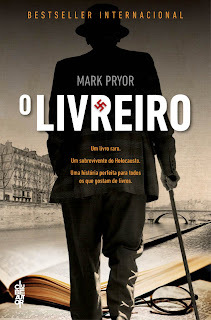 Oh, since I'm on the subject of being covered, I just wanted to share the artwork for the Portuguese edition of The Bookseller that my agent sent me today. Love it. You're far braver than I in terms of potentially provoking a snake/croc--I may be a biologist, but a herpetologist I am not. Accidentally or on purpose. Just no. Mammals, please. Glad the warrant service went well, and the advice from cooler heads was unanimous :). That always makes decisions easier. And the cover? Well, it's awesome--love it! Thanks Lee. Honestly, I doubt I'm as brave as I used to be. Having kids changes things, I'd be pretty stupid to disappear on them into the belly of a snake. :) And yes, isn't the cover great?! I agree with those two sagacious women.